Carol is a regular contributor of Via Francigena articles to the news section of the official Via Francigena website. You can follow the links to read about her Via Francigena articles. On the 17th May 2018 I took part in the first Via Francigena Marathon for 2018. The 42 km marathon goes from Acquapendente to Montefiascone. The pilgrim is required to walk 100 km from Montefiascone to Rome to receive the Testimonium for making the pilgrimage. This year I took part in an event which was designed to explore a new route of the Via Francigena across the Franco-Swiss border. The section from Pontarlier to Orbe is historically accurate, but the trail is not well defined at this stage. This year on 17th June I participated in the Francigena Val di Susa Marathon. This marathon began in Avigliana and ascended nearly 1000 m to Sacra di San Michele, and finally ended up in the ancient Roman amphitheatre in Susa. On the 8th September I participated in a ‘I love Francigena’ from Fidenza to Medesano in Italy. In this event 22 pilgrims walked both to check the trail and its signage, and to promote the Via Pilgrimage. I have a special mention in the article being the only Australian in the group! The Via Francigena offers 4 promotional marathon events each year. Here is my article about the Acquapendente to Montefiascone Marathon which took place on 4th June 2017. On September September 2, the Companions of the Via Francigena in Switzerland met at the Grand St Bernard Pass Hospice for the twenty year celebration of the opening of the Via Francigena trails through the Pass. In this article you can read about this extraordinary gathering at the Grand St Bernard Hospice. This year I have spent more time in Switzerland visiting places where Sigeric walked on his journey home from Rome to Canterbury in 990. Do read about my adventures along the Swiss Via Francigena pilgrim route. My article is also published on the official Via Francigena website. 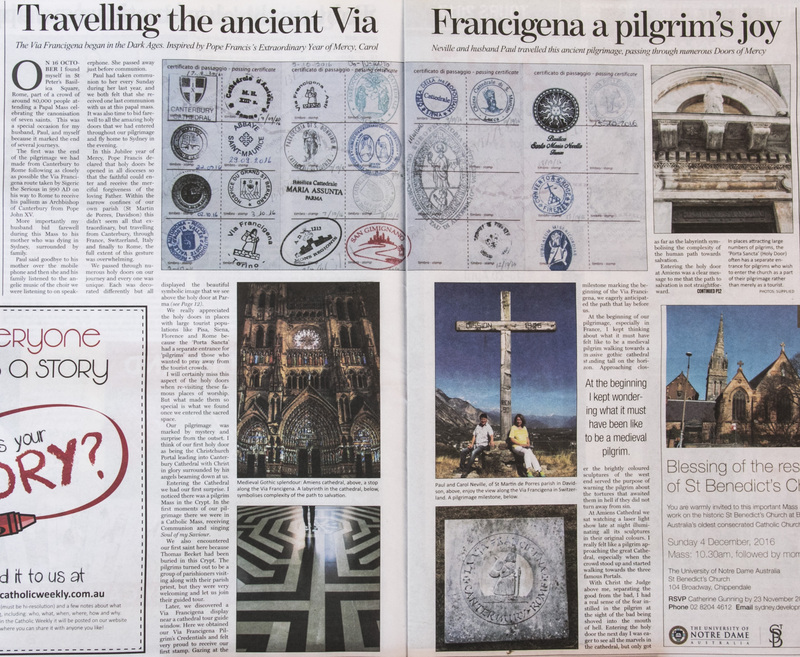 This article is all about my Via Francigena pilgrimage from Canterbury to Rome in 2016. I travelled the whole way by car. And even though I did not make the pilgrimage on foot, so many amazing things happened along the way that I just had to write my story. As a consequence, it has been published in two places – the official Via Francigena website and the Catholic Weekly, Sydney, Australia. Here is a copy of my article published in the Catholic Weekly, Sydney, Australia in November, 2016. On my Accidentally Cultured blog site there are heaps of travel stories both humorous and informative. So do visit and enjoy my stories and photographs! Most of my professional life was spent teaching Science, Art and Religion! I have a streak of the Leonardo in me! So, I did end up writing some best selling Science text books. I am sole author of this study guide for the School Certificate. In addition, I am co-author of this best selling Science Focus text book that has been widely used in High Schools in New South Wales, Australia. Science Focus was so popular it went into a second edition.